WASHINGTON — Another round of winter weather is in store for the D.C. region, with snow, sleet and freezing rain all factoring in to a bleak outlook for the Monday morning commute. Federal offices will open two hours late Monday, the Office of Personnel Management announced Sunday night. Federal employees will have the option for unscheduled leave or unscheduled telework. Several school districts are also closed or opening late. Expect slow travel from a period of light snow, sleet and freezing rain moving in from west to east late Sunday evening through Monday morning. As predicted by Storm Team 4 meteorologist Matt Ritter, snow began falling early Sunday night in the D.C. metro area, but with minor accumulation. A winter weather advisory is in effect for D.C. and parts of Maryland and Virginia until 10 a.m. Monday, with areas to the north and west of the capital most at risk for snarled rush hour traffic from icy conditions. Freezing rain and sleet will be the biggest concerns of Monday’s storm, which is expected to kick off Sunday night with a wintry mix. Storm Team 4 meteorologist Somara Theodore says the immediate D.C. metro area will see precipitation — maybe even beginning as snow — just after sunset. Snow, if any, will quickly switch to a wintry mix, making for iciness on the roads Sunday night and through the Monday morning commute. The National Weather Service said Northern Maryland can expect less than one tenth of an inch of ice by sunrise, enough to make things potentially difficult for travelers. Snow accumulation chances are higher from Montgomery and Loudoun County to the Interstate 70 corridor — anywhere from 1 to 2 inches. When the wintry mix comes in, widespread iciness is expected, making for dicey spots on bridges and side roads. For counties like Calvert and St. Mary’s, it’s looking more like a cold rain event with isolated icy spots farther north. Virginia road authorities weren’t taking any chances. Brining was already underway on major roads well in advance of Sunday night’s storm. Maryland Department of Transportation spokesman Charlie Gischlar said the major roadways have already been treated and that crews and contractors will be out to keep the roads clear while the snow and ice accumulates. MDOT now offers an app that allows residents to track where plows have been in order to find the most well treated roads. Virginia Department of Transportation spokeswoman Ellen Kamilakis told WTOP pre-treatment began on Saturday. The goal, Kamilakis explained, is to buy crews time once the storm starts before ice begins to bond on the pavement. Aside from the ice, the best odds for up to two inches of snow are limited to Northern Maryland along the border with Pennsylvania. 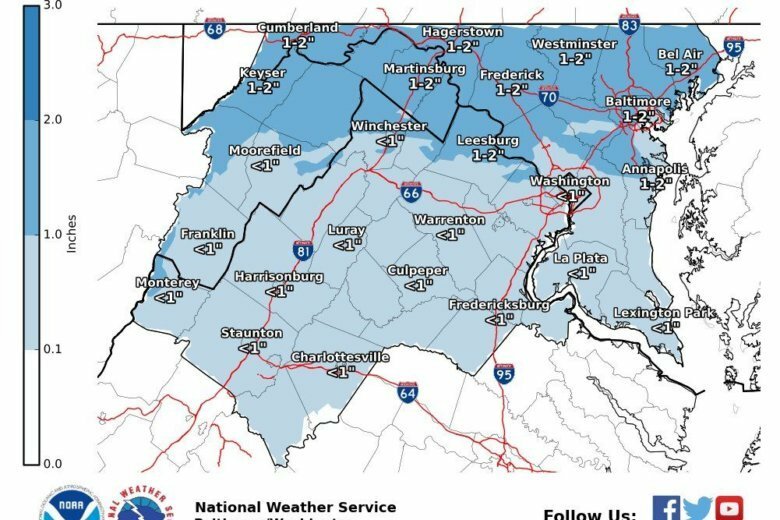 D.C. itself can expect up to an inch of snow, with an outside chance for over an inch — though a relatively warm, stable air mass and an anticipated changeover to all rain should act to keep snow accumulation low. In Virginia: Arlington, Fairfax, Loudoun, Prince William, Fauquier and Clarke counties, including the cities of Alexandria, Fairfax, Falls Church, Manassas and Manassas Park from 7 p.m. Sunday to 10 a.m. Monday, as well as Stafford and Spotsylvania counties, including the city of Fredericksburg, from 10 p.m. Sunday to 7 a.m. Monday. A Winter Weather Advisory means periods of snow or other winter weather will cause travel difficulties. Expect snow covered roads and limited visibilities, and use caution while driving. A second storm is in store for Tuesday. Like the first, it’ll start out with a wintry mix on Monday night, and transition to rain through Tuesday morning. Though timing and exact impacts are somewhat unclear, Northern Maryland along the I-70 corridor was again looking to face the most significant impact from round two. In its Sunday forecast discussion, NWS said those areas will likely again need winter weather advisories or warnings following Monday’s winter blast. Highs: mid 30s to near 40. SUNDAY NIGHT: Snow beginning between 5-10pm with minor accumulations possible. Snow mixing with sleet and freezing rain. DC metro, central VA, and southern MD changing to plain rain close to the morning rush. Lows: upper 20s to low 30s. TOMORROW: Light rain and drizzle most areas, plus areas of fog. In northern MD, a wintry mix of freezing rain and rain. Highs: low 30s to near 40. TUESDAY: Rainy and raw. Patchy ice in northern MD in the morning. WEDNESDAY: Rain ending in the morning. Breezy and mild early, but turning windy and colder later in the day. Highs: upper 40s to low 50s.